* Kevin Lea and Bob Enyart Discuss "Woolly" Mammoths: In this special edition of Real Science Radio, Kevin Lea, with his background in nuclear physics, talks with Bob about frozen mammoths. Pastor Lea of Calvary Church, Port Orchard Washington, describes the roll of the Earth which explains why we find remains of millions of mammoths (and horses, rhinos, etc.) in the arctic circle where they could not live because while each animal requires many gallons of liquid water and more than a hundred pounds of vegetation per day, the arctic has frozen surface water and gets almost no sunlight through it's long winter, when its scant vegetation is then completely dormant. And of course, woolly mammoths had no wool. Kevin and Bob, using as a guide Dr. Walt Brown's book In the Beginning, talk about the mammoths being buried in the arctic circle in rock ice, muck, and loess (this German term is pronounced there: lerse; here: less). The Bible records that the fountains of the great deep broke forth and flooded the Earth and, as it turns out, water that shot up to space but without escape velocity came back down as supercooled ice at colder than 150 degrees below zero, and froze mammoths so quickly the temperate climate vegetation in their stomachs were preserved! When time of death is estimated for the frozen mammoths, it lies in late summer or early fall, providing another piece of evidence against the hypothesis that each of these creatures died in unrelated events. And hear an amazing prediction, that beneath upright (and other undisturbed) mammoths, there is no layered strata, oil, coal seams, or limestone! Why not? Because these mammoths, frozen while still standing, were killed at the very beginning stages of the global flood and all those features are a result of that flood! * Other Great Kevin Lea Shows on Real Science Radio: Enjoy Kevin Lea, hydroplate expert, on the origin of comets, liquefaction, and even the 365-day year. 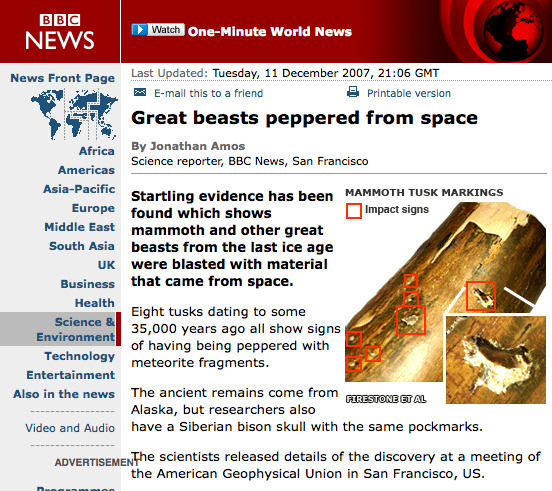 * Tusks Hit with Meteorite Fragments: See below for the discovery of mammoth tusks that were hit with iron-nickel meteorite fragments. * Debate Fact Checking: Popular atheist AronRa brought up mammoths in a debate with Bob Enyart as an example of creationists being unreliable, regarding the claimed burial of millions of mammoths and that their diet included tropical vegetation. Therefore RSR provides the following and plans to occasionally update this page with documentation on the numbers of mammoths buried and the types of vegetation that grew in their environment. Through such causes almost 50,000 mammoth tusks are said to have been found in Siberia between 1660 and 1915, serving an extensive mammoth ivory trade. But this is nothing compared to those still buried, according to Vereshchagin, who calculates that the heavy erosion of the Arctic coast spills thousands of tusks and tens of thousands of buried bones each year into the sea and that along the 600-mile coastal shallows between the Yana and Kolyma [rivers] lie more than half a million tons of mammoth tusks with another 150,000 tons in the bottom of the lakes of the coastal plain. The north of Yakutia [covering a minor portion of the Arctic] has long been known to be an immense storehouse of frozen disjointed bones of many hundreds of thousands of large Pleistocene mammals—mammoths, horses, woolly rhinoceroses, bison, musk-oxen... the quarrying of mammoth ivory has gone on for many centuries... the greatest interest lies in the discovery of whole frozen bodies... Study of the position of these bodies... and of the contents of their stomachs and intestines may answer the age-old question of why the mammoth (or woolly elephant), together with this rich assemblage of large herbivores, died out. * See Also: Walt Brown's fabulous chapter on Frozen Mammoths; the section in the RSR debate with atheist AronRa on mammoths (also pasted just below) and the fun show that Kevin Lea and Bob Enyart did on Comets! I challenged Bob to show that there were [n]ever any mammoths found frozen with tropical flora anywhere near them. … Bob also said mammoths could not possibly survive in the environments where millions of them are known to have lived and I refuted his claims about those conditions too." Aron: "There were 51 mammoths." Bob: "There are millions." Aron: "I found that there were 51 mammoths, not millions. And that none of them, not one, was found with tropical flora in their mouths… so when you look into the data, if this were a written discussion…"
BE: "I've got the data. The tonnage of mammoth tusks, that were sold on the worldwide market, indicate that there were millions of mammoths that were buried in Siberia, and at the Arctic Circle, and north of the Arctic Circle. And there were mammoths that had the seeds of tropical plants, the seeds, in their digestive track." Enyart: We'll, I could give you the data. 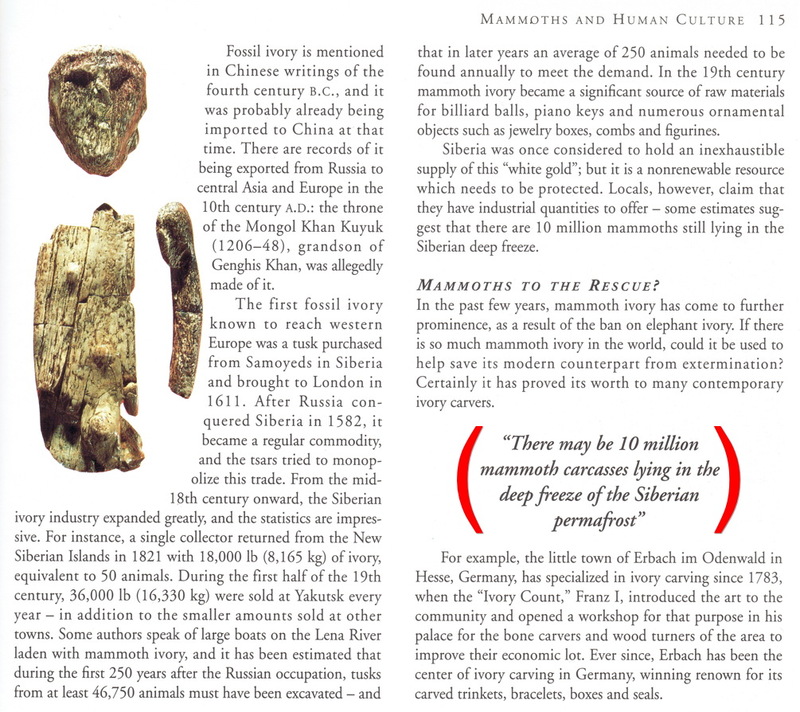 Enyart: …about [there being] over a million mammoths buried. Aron: Yeah. Yeah, I definitely do. And it's a formal challenge. Enyart: How about a $500 bet to your favorite charity, that the documentation shows that over a million mammoths have been buried? Aron: With tropical flora in their mouths? Enyart: No, no. There was just one like that. So here is the documentation I promised. "The Siberian permafrost blankets millions of square kilometers… Hidden in one of the upper layers of this mass, corresponding to the Pleistocene epoch, are the remains of an estimated 150 million mammoths. Some are frozen whole, as if in suspended animation, others in bits and pieces of bone, tusk, tissue and wool." Creationists are excited about this data. But the hard scientific data that atheists prefer to ignore (just Google this stuff) includes millions of mammoths buried in permafrost, 14C everywhere, Grand Canyon nautiloids, and dinosaur soft tissue! 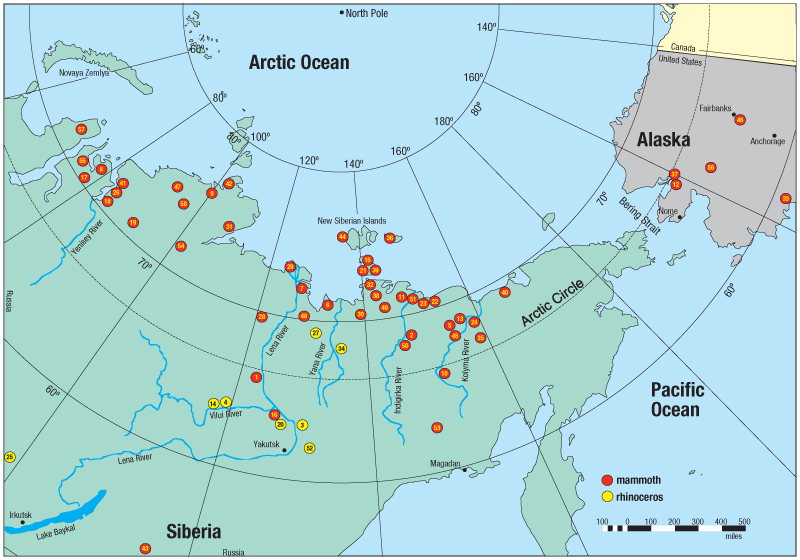 Dr. Walt Brown's map along with his Table 8 presents the locations and documentation for each of the 58 sites shown where frozen mammoth and rhinoceros remains have been discovered. Just like 14C in diamonds, and tissue in dinosaurs, if you want to find buried mammoths in permafrost all you have to do is just go look. Aron: No tropical plants near mammoths in Arctic. Bob: Yes there were. In fact, there's a lot of tropical flora buried near the mammoths in the Arctic. "[Canada's Ellesmere Island, well inside the Arctic Circle, was] warm enough throughout the year to sustain palm trees and other tropical flora and fauna." Daniel B. Kirk-Davidoff et al., "On the Feedback of Stratospheric Clouds on Polar Climate", Vol. 29, 15 June 2002, p. 51. 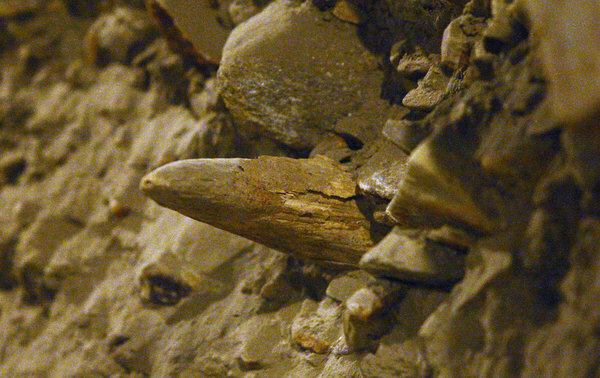 "On eastern Axel Heiberg Island [in the Arctic Circle in Canada], ... fossil forests are found. ... just 680 miles from the North Pole. The stumps of ancient trees are still rooted in the soil and leaf litter where they once grew. ... many trees reaching more than a hundred feet in height." Jane E. Francis, "Arctic Eden,", Vol. 100, January 1991, pp. 57–58. The strange loess hills that Siberian mammoths are often found in contain, "two and a half times the amount of carbon that's in all the world's tropical forests." The most well-studied frozen mammoth is Berezovka, with its mouth and tongue well preserved, and according to Nature, its "mouth was filled with grass, which had been cropped, but not chewed and swallowed." And the grass was frozen so quickly that, "it still had the imprint of the animals molars," wrote Lister and Bahn in Mammoths on page 46. However, its stomach contained three seeds from plants that produce delicate, yellow buttercups. Fragments of other flowers were in its stomach. No large flowers were in its mouth. 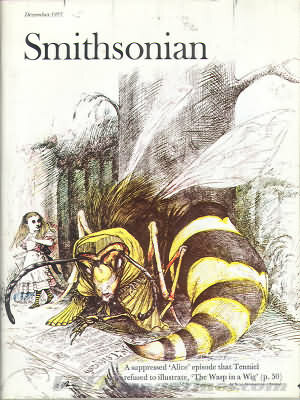 As summarized by Dr. Brown, "Its stomach contained three seeds from plants that produce delicate, yellow buttercups. Fragments of other flowers were in its stomach." Aron denied that these creatures would have frozen quickly, and he offers that one particular mammoth was buried while eating a tulip from Denmark. However unless frozen rapidly, vegetation would digest in an animal's stomach and intestines. And in all, "Twenty-four pounds of undigested vegetation were removed from Berezovka and analyzed by Russian scientist V. N. Sukachev. He identified more than 40 different species of plants: herbs, grasses, mosses, shrubs, and tree leaves. Many no longer grow that far north; others grow both in Siberia and as far south as Mexico." Alaska Update: A RSR listener in Fairbanks, Russ Holmes, called to alert us to the opening to the public in August 2012 of a 100-foot permafrost tunnel. Interestingly, in this tiny stretch of exposed sediment, a news photo documents a mammoth tusk protruding from the tunnel wall. 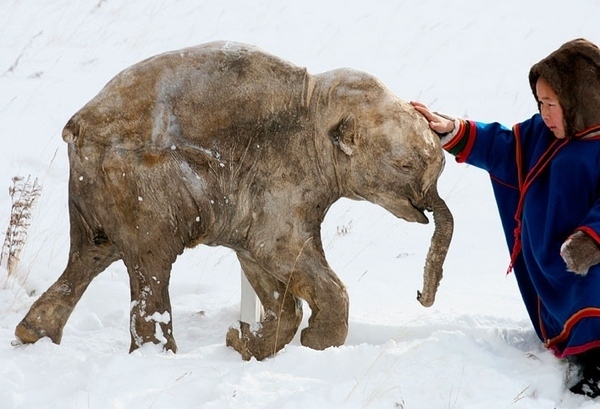 Best Mammoth Find in a Century: In October 2012, an 11-year-old boy walking a few miles from his home in norther Siberia came across the most well-preserved mammoth found since 1901. This find is said to have confirmed that the mammoth hump is not skeletal (which RSR believes should have been expected based on various previous finds). Rather, the mammoth hump is a fatty store similar to that of a camel. Not surprisingly, this has been interpreted as an adaption for surviving harsh arctic winters. Of course, if camels were known only from northern fossils, their hump would have been similarly and thus wrongly interpreted as an adaption to severe cold. Of Interest: 2013 report from Alaska of a more recent, and more southern, forest thawing beneath retreating glacier ice. Read more about this at the bbc.co.uk and on this page of Dr. Brown's In the Beginning book! * 2015 Update -- More Evidence of Mammoth Suffocation Deaths: See Michael Oard's paper Evidence some wolly mammoths asphyxiated from dust. Personhood is the most important human rights movement of your lifetime. Will you be one who fights to end the systematic dehumanization and murder of an entire class of citizen? If you live in any state in America, you can advance personhood via the 2010 ballot or in one of three different ways. If you live in Colorado join by calling or e-mailing Colorado Right to Life. Today’s Resource: You can enjoy one or two of Bob Enyart’s entertaining and insightful videos each month, mailed to you automatically, simply by subscribing to the BEL Monthly Topical Videos service! Also, you can check out the other great BEL subscription services! Also the Real Science Radio shows have been compiled into mp3-CD's so that you can now order all of the shows from 2007, 2008 or 2009 from the KGOV store.